This is the fourth post in a five-part series about tracking your fitness. Now that you have been convinced to track progress using body fat % and you've figured out how to use your new body composition scale, I'll talk about using your fat percentage to track your progress, what your long-term goal should be, and how quickly you should see results. As I mentioned in the first installment of this series, one of my favorite fitness blogs, Nerd Fitness, wrote a terrific article about it. 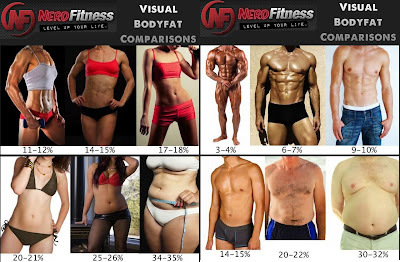 Since the article was published, the images below showing typical bodies as a range of body fat percentage have taken on a life of their own. The correlation between body fat percentage and good health, fitness level, and physical appearance isn't ironclad, but it’s a much better metric than anything else we have. It doesn't need to be adjusted for height, weight, or anything else. 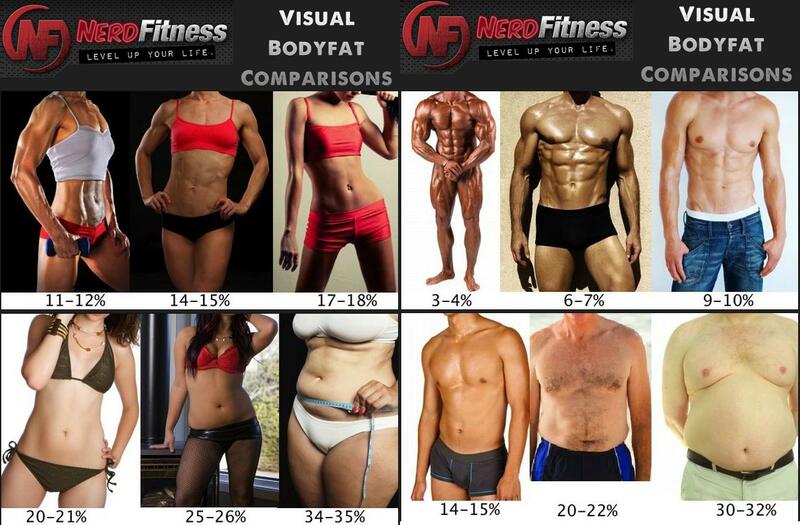 Obviously, there will be differences in appearance for people who have the same percentage of body fat. But, these pictures give you a suprisingly good idea of what to expect for both men and women. Now, as a side note, this is a good place to mention that differences between those who are more muscular and those who aren't start to show up as people become more and more lean. Men without much muscle who are under 15% fat start to look weak and thin. Women under 20% fat who have more muscle mass start to show more of that muscle. Most men would target something in the 10-12% range while most women would target the 18-20% range. I would view these ranges as the ultimate target zones. And when I say "ultimate target goal," we're talking holy-cow-look-at-you appearance. Any movement that you can make in that direction will be a benefit. A woman starting at 40% body fat that gets down to 30% would see tremendous improvements in health, fitness, and appearance. To just about everyone out there, body weight is still the thing that everyone understands and can picture for themselves. So, we can go ahead and consider body weight, but remember this: use body fat % as your main measure for progress. Your "target weight" will always be a ballpark figure and will change over time as your lean body mass changes. The body fat % target is the target that doesn't budge. 18% body fat looks like. goal and go from there. Let's assume that you replace fat with muscle in equal weights until you reach 20/80. In that case, you have 34 lbs of fat and 146 lbs lean body mass. Now, let's assume your lean body mass remains unchanged at 108 lbs and you reduce your fat mass until you hit 20/80. In that case, you have the same 108 lbs of lean body and 27 lbs of fat. That's 45 lbs lost. Those are two very different scenarios! An experienced trainer or nutritionist will tell you that these two scenarios are the extremes and you should expect something in the middle. So, I'll wave my arms in the air a little bit and guess that you are looking to lose 25 to 30 lbs... or so. Again, we only go through this to give you a ballpark idea of what you are up against. Your real measure is body fat %. If you still need a good illustration for that, if you were to use body weight or BMI any gains made towards scenario 2 would be evident but any gains made towards scenario 1 would not. Now, remember as you do this for your current weight and body fat. I've targeted 20% for women and something like 12% for men. If the images from Nerd Fitness above seem like they are so far away that you want to throw in the towel, then pick a number that seems to be in reach. You're at 40% now? Aim for 30% and go from there. You've probably got a long road ahead and imagining small steps might just work a great deal more for you. So you've identified your ultimate damn-you-look-good target and maybe you've played with numbers a little to get a real rough estimate of your target weight. Remember, this target weight is very rough and will move as your lean body mass changes. Here is how we look at week-to-week and month-to-month progress. Your lean body mass may stay the same over time or it may go up. That is just fine, even if you are trying to "lose weight"! Strength training accelerates fat loss by adding muscle to the body. This muscle mass will help you lose fat mass in the future. Your fat mass may seem shockingly high, but don't let that discourage you. Even a perfectly shaped 150 pound woman needs 30 pounds of fat to keep her figure. Your goal is to reduce this number an average of 1 to 2 pounds per week. While I suggest doing a weigh-in each week, don't expect to see a 1 to 2 pound change every time. There is enough variation from day-to-day and measurement-to-measurement that will obscure such a small amount. You'll might see a loss of 5 lbs of fat one week and a gain of 2 lbs the next. Those shifts up and down will be uncertainties in the measurements from the scale or slight differences in food digestion from one measurement to the next. Just expect an average of 1-2 per week over the course of each month or so. The last step in this process is an easy one, find a place to store these results. 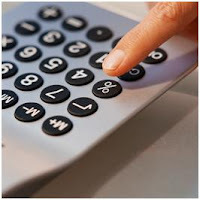 You can use pen and paper, a spreadsheet somewhere, or a website that is designed for the purpose. I use the weight tracking tool on SparkPeople and I've heard very good things about My Fitness Pal. Whatever method you use to track these, just be sure that you aim to measure yourself about once per week. And, by all means, step beyond just body weight and BMI and start tracking body composition! On to part 5, the final post of the series!